The world's best selling scan tool just got better! 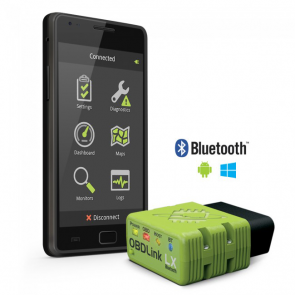 OBDLink® has both Bluetooth & Wi-Fi options making it a breeze to connect to your Android, iPhone, iPad, iPod, Blackberry, or laptop. We engineered OBDLink® to be compatible with more vehicles and dependably communicate faster than our competitors. OBDLink® is also the only firmware upgradable scan tool on the market! Free U.S. Priority Shipping! Turn your smart phone, tablet, or PC into a sophisticated diagnostic scan tool, trip computer, and real-time performance monitor. OBDLink® MX+ can access GM SW-CAN & Ford MS-CAN networks in addition to standard OBD-II protocols. Free U.S. Priority Shipping! Turn your smart phone, tablet, or PC into a sophisticated diagnostic scan tool, trip computer, and real-time performance monitor. MX Wi-Fi can access GM SW-CAN & Ford MS-CAN networks in addition to standard OBD-II protocols.